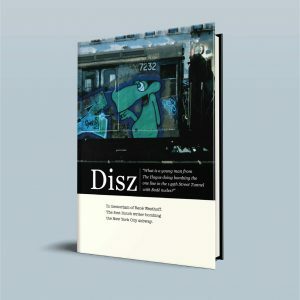 This story is a special visual epilogue that Dutch Graffiti Library wants to share due to all the positive and remarkable reactions we have received after publishing the book: “Disz. The first Dutch writer bombing the New York City subway.” We want to give some more context and show a lot of the Australian footage taken by Disz in 1985. In 1983, at the age of 22, René Westhoff († 2012) decides to travel from The Hague, the Netherlands to visit family in Australia. What happens shortly after arriving in Australia is told in Willem Drossaard’s book ‘Op reis in het kielzog van Abel Tasman’ (On a journey in the wake of Abel Tasman), published by Infopers uitgevers BV, the Netherlands. The book reports on the travel experiences of a Dutch couple on a trip through Australia, New Zealand and Bali in the early 80s. “Southeast of Melbourne, we drove along the coast and crossed over to the Philip Island, also known as Penguin Island. On the way back, we stopped by the little country village of Pakenham, to look for the son of a Dutch acquaintance, who had been “living” there for a year. This last word was deliberately put between quotation marks because the boy had spent most of last year in a hospital and rehabilitation center. Having just arrived, to spend his holiday at his aunt’s in Pakenham, he had climbed a motorcycle to embark on a long trip to Sydney. Just before Sydney, he was hit in a corner by a car driver, who had run the corner too wide. With compound bone and shoulder fractures, he was admitted to the hospital. When he returned to Pakenham, after a long period of rehabilitation, he decided to take another ride on the motorcycle, which had been repaired after his accident. An hour later he was transported by ambulance to the nearest hospital, again with compound leg fractures, this time becoming the victim of a drunk motorist. He is now rehabilitating at home with his aunt. We heard his story while we were sitting with him in the garden, which bordered the blackened trunks of the eucalyptus forest around the house. This forest had been one of the hotbeds of a series of terrible forest fires that had raged in Victoria this year on Ash Wednesday, 1983. The family of the young motorcyclist had fled in panic when the forest fire suddenly, which had started a little further on due to the strong wind, turned into a firestorm, which set the whole forest around the house on fire. All this happened just before the boy had arrived in Australia. He let us read the reports of the fires, which appeared in the Herald and Weekly Times in Melbourne in 1983 under the title “Ash Wednesday”. After so much adversity it’s also in Australia were Dutchman René’s passion for Bodé and hip-hop takes further shape. As he comes across the book Subway Art, René starts taking on graffiti himself late 1984. His name: Disz. Together with his cousin (Sheak a.k.a Jasper RDC) he frequently looks for graffiti in Sydney and Melbourne. He photographs and documents the origin and location. Battle Cry, Zulu, Break into hip hop by BAZE, Keon park squash court Epping line Melbourne. Downtown Express by BAZE, Melbourne. Graffiti Fever 2 by B-24 and Teedo, Zulu Artists March 8. Planet 3 by Screbs and 2Quik Ric April 85 The Domain Sydney City, East Line, Martin Place end. Tracer by Zapped (aka Cassim (one of the first) Zulu Artists, FAB4 Future Art Beat) August 1984 Rabbit by Micro 2 Zulu Artists. Legend by Stylz. Zulu Artists by Ruzz Quikdraw, March 1985. Buffalo by Mirzo Jan 1985. The domain subway exit, East Line Sydney City (between Martin Place and Kings Cross). Zulu Nations Unite by Micro 2 and Saturn 3 Januari 1985 Zulu Artists, Kings Cross, East Line. Tac, Crazy, Wasted, My Kosmic Krew, Wayne Alien (Digit Dance Team), Qee and Wasted. Summer Hill, Inner West Line April-ish 1985. Subway Kolosus Outline-piece by Stylz Character and Clouds by Ruzz Quikdraw Zulu Artists, Redfern Feb 1985. Supreme by Kontrol CIA, June ish 1985. Edgecliff, East Line, Eastern side. Crime Style; at Burnley station, circa 1985 by Flexi Dee. AG27 and PS19, Future 4, by Astro Gaza (Dskyz) and Prime Style (Prime), circa 1985. Late 1985, Disz decided to move further by traveling to New Zealand. After that he continued on to San Francisco in search of Vaughn Bodé’s descendants and up to New York City, the mecca of hip-hop and graffiti culture. Finally after more than 30 years an answer to the question “What is a young man from The Hague, doing bombing the one line in the 145th Street Tunnel with Bodé nudes?” asked in the book ‘Spraycan Art’ has arisen! A publication by Dutch Graffiti Library with quotes of Sae FC, West FC, Jean Badboyz Inc., Henry Chalfant and Jim Prigoff.